Sunny Island SI5048-US The Sunny Island 5048-US is a bi-directional battery-based inverter/charger that can be used completely off-grid, or for battery backup in grid-tie systems with Sunny Boy grid-tie inverters. 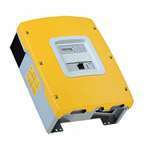 The Sunny Island is a complete power center with 5kW of sine wave output power, low idle losses, high efficiency, integrated battery disconnect, 100A battery charger, and integrated data monitoring and system control, all in a compact wall-mounted package. The SI5048-US has a single-phase output of 120V at 60Hz. Two inverters can be stacked to provide 120/240V 60Hz split-phase output. 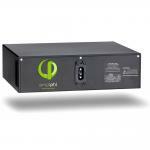 Connect up to four SI5048-US inverters in series/parallel for up to 20kW at 120/240V 60Hz. Or, use three inverters for 15kW at 120/208VAC three-phase power. Add a Multi-Cluster Box and connect up to four sets of three inverters (called clusters) for up to 60kW of three-phase power. The Sunny Island can back up critical loads during utility grid blackouts. Combine it with a Sunny Boy grid-tie inverter system and connect it to a bank of batteries, and the Sunny Island will allow the PV array to power loads and charge the batteries. This is done as an AC-Coupled system, where the AC output of Sunny Boy grid-tie inverters is connected to a critical-loads subpanel (rather than the main panel). The subpanel is also connected to the AC output of one or more Sunny Island inverters. Under normal conditions, the power from the PV array and the Sunny Boy inverters passes through the subpanel and the Sunny Islands built-in transfer switch on its way to the grid, all at the same high efficiency as a regular Sunny Boy grid-tie system. During night or cloudy days, grid power flows through the SI5048s transfer switch to power loads connected to the subpanel. During a power outage, the Sunny Island opens the grid connection to provide AC power to the emergency subpanel, drawing energy from the battery bank. The power outage will turn off any Sunny Boy inverters connected to the subpanel; they turn back on (after a 5-min period) when they sense the AC from the Sunny Island. Loads smaller than the output of the PV system are powered directly off of the array. When the load is larger than PV arrays output, and at night, energy is drawn from the batteries to make up the difference. If the batteries need charging, AC power from the Sunny Boy inverter(s) flows backwards through the Sunny Island(s) to charge the batteries. If the batteries are full, and the PV system is producing more power than the loads require, the Sunny Island(s) will communicate with the Sunny Boy inverter to decrease its power output. If there are no loads and the batteries are full the Sunny Boy inverter(s) will shut off completely, preventing battery over-charging. All of this is completely automatic. Off-Grid Power In off-grid systems, the Sunny Island works with Sunny Boy inverters exactly as it does with grid-tie systems, with one difference: Rather than act exclusively as a back-up, the system operates as if there were a permanent grid outage, and the critical loads panel becomes the main panel. A generator can be connected to the Sunny Islands AC input to provide back-up and battery charging. The battery bank can also be charged using a PV array with a standard PWM or MPPT charge controller, or by other sources like micro-hydro and wind turbines. Data monitoring The SI5048-US utilizes removable SD cards to store performance data from the integrated data logger and allow easy firmware upgrades. 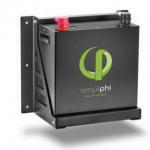 State-of-charge metering helps with battery management to ensure maximum battery life. The SI5048-US works with the SMA Sunny WebBox and SensorBox monitoring accessories. The Sunny Island SI5048-US is UL Listed to UL 1741 for the U.S. and Canada. 5-year warranty.